An Okada rider, Oladapo Omotoso, narrated yesterday how his newborn baby Temitope Omotoso, and her mother, Taiwo, were “detained” for 22 days by the Management of the Ondo state-owned Mother and Child Hospital for his inability to offset N40,000 hospital bill. Baby Temitope was given birth to in the government hospital, solely for the delivery of babies and taking care of children under age five, through caesarean operation. Findings by Vanguard in Akure, the state capital, showed that the baby and the mother were detained following the inability of the breadwinner of the family, Oladapo to offset the money billed them for the operation. Under the immediate past administration, such caesarean operation and normal delivery of babies were totally free Vanguard gathered that while baby Temitope was detained between November 16 and December 10th, 2017, reports had it that those who could not pay their medical bills in the government hospitals were made to deposit their belongings such as motorcycles and generator sets to the hospital until they offset their debt. Narrating his baby and wife’s ordeal to newsmen, Oladapo said they were made to pass the night for that number of days “ on the chair in the hospital”. 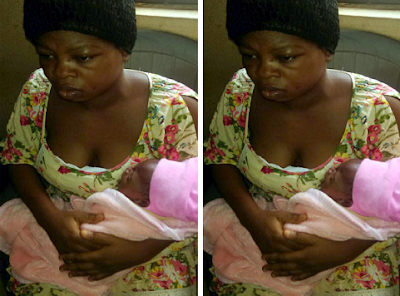 “ My inability to pay the N40.000 required by the hospital made my new baby named Temitope and her mother to suffer untold hardships in the hospital. “On the 16th of November, I rushed my wife to the hospital. On getting there, they asked me to make some payments before they can proceed with any operation. I said I don’t have much on me. They gave me an emergency form to fill so that they would be able to take care of her just to save the life of the mother and baby first. “They did the operation successfully, the following day which was 17th; I was called to buy some drugs. I told them I could not get money to buy those drugs. “On the emergency form which I had already filled the day I came to the hospital, they said I should take the form to the pharmacy so that I can use the form to buy those necessary drugs for my wife. They discharged her four days after. “On the 21st, they asked her that she should sit on a chair because they have already discharged her so as to create enough space for other people to come in. “I said I will go and look for money. I went out I could not get any money. I came back to the hospital and I started begging. I went to the CMD. He said if he has to waive everything, he can’t waive the caesarean pack. “He said the caesarean pack does not belong to the hospital. He said some companies brought it to the hospital, adding that he will waive the hospital bill which is within his capacity. He will waive the bed fees and the items which they used for normal delivery. The total money waived for me was N15.000. “However, they said I will need blood clearance. On the 28th, I could not raise the money; I went to Ministry of Women Affairs for financial assistance. But they declined to help me. I went back to the hospital. “The Welfare officer told me to pay for the caesarean pack and the blood clearance. Five days ago, I paid N15, 000 out of the money for the CS pack. “I later paid the balance of N5, 000 making N20, 000. After the payment, I went to the Welfare he said he had helped me enough that I should go to the lab for blood clearance. “ It was after I donated blood that people in the lab said I owed them. I asked how much and they said N6, 500. “The total amount they expected me to pay is N40, 000. I have paid N20, 000. I paid the money 15 days after delivery. He said that Temitope was his second child that was given birth to in the hospital noting that he did not pay a dime when his first child was delivered at the same hospital. Contacted, the Chief Medical Director of the hospital, Dr Adesina Akintan, said that the economic reality in the country necessitated the hospital insistence that those treated should pay for such treatment. Akintan said that the hospital normally informs patients that they would be treated and that later they will defray the debts. He said that in the case of the baby, the mother was brought in an emergency condition and to save the mother and the child we decided to swing into action. The CMD said “We did not detain the baby and the mother. We informed them right from the beginning that they will have to pay but to save both the mother and the baby we decided to carry out the operation. But we found out later that he was having some challenges in defraying the debt. According to him “the hospital was owing to its contractors over N26million for the supply of drugs and other items required for operation in the hospital.